As is the case when I can't sleep, I found myself flipping through old cook books a few nights ago. Unlike modern cook books, with their flashy photos and alarmingly exotic descriptions, older cook books are simpler, straightforward, and rather calming. But they can be surprisingly innovative. Chances are that any "new" technique I think up or that gets some press in the New Yorker was already thought up by some farmer in the 1200's, then forgotten about. Such was the case with an Italian recipe for Mazzafegati Dolci. Hailing from Umbria, I found Guglielma Corsi's description for sweet liver sausages to be rather extraordinary. 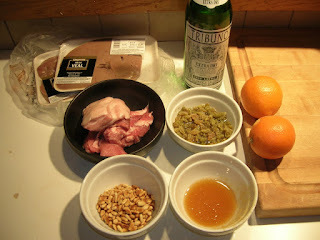 Normally I try to match the robust flavor of liver with strong ingredients, such as chilies, mushrooms, or smoked meats. It never occurred to me to try to mellow the flavor of vinegar with something sweet. The ingredients were very simple: pork liver, some pork fat to add moisture, toasted pine nuts, dried golden raisins (soaked in hot water and vermouth), honey, and the zest of an orange. I was short two of these ingredients. Three if you count the fact that I didn't have any sausage casings. So I substituted. Instead of pork liver I used veal liver. And even then I was short the two pounds of liver that the recipe required. So I used a pound of fatty pork cuts (streaky cuts of shoulder fat that I took off a roast) to make up the meat and as the necessary pork fat. It was sorta meat/sorta fat, so I figured it would cover me. Missing sausage casings was a bigger problem. But I did have several bags of caul fat (lovingly procured for me by Carla). 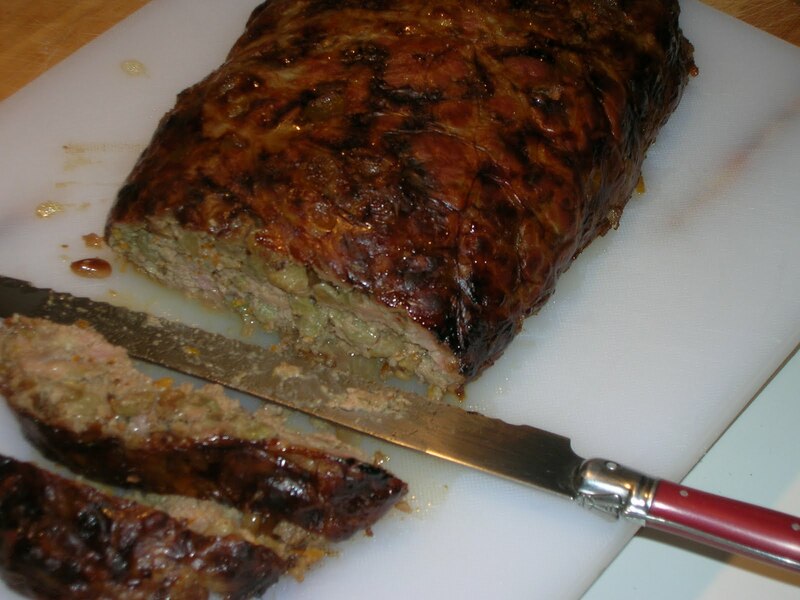 So I decided to make a liver sausage/meatloaf-esque mound o' meat. Caul fat is unique in an animal's body. It's designed to cushion and protect internal organs, as well as hold them in place. 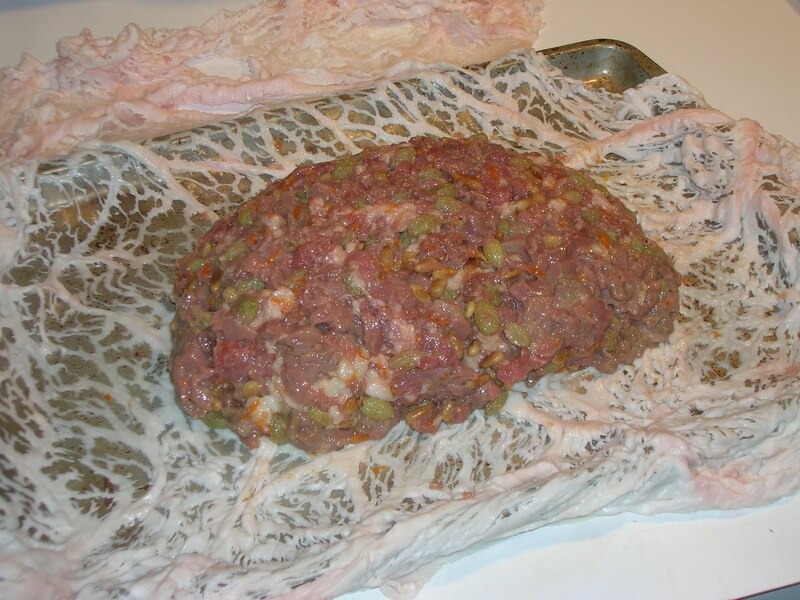 To do this job, caul fat takes the shape of a giant spiderweb of fat. It has a fishnet-like appearance, which made an Italian chef once refer to them as "Sicilian pantyhose" (for you Top Chef viewers). 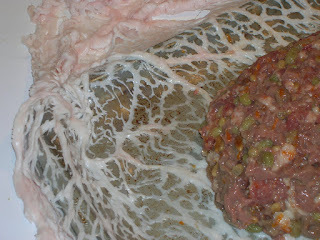 Once you wrap meat in caul, the caul contracts during the roasting process, holding the meat together. It also slowly melts, basting the meat as it cooks. If you're the type of person who is a little freaked out by the texture of natural sausage casings, don't worry. Since it is shrinking and melting at the same time, the caul integrates into the roast, becoming very tender and breaks apart easily in the mouth. It won't feel like you have an indigestible onion skin in your mouth, as some tough sausage casing do. So I mixed everything together, added a bit of salt and white pepper, and roasted it off at 375 F for about 45 min. It didn't take long to come up to an internal temp of 160 F, but emerged looking beautifully burnished. As I tasted it, the roast didn't taste particularly sweet, although the citrus of the orange zest was the first flavor to hit your tongue. It really reminded me of a pate I had that was based off the dish canard a l'orange. I wouldn't describe it as a "sweet dish," although I really liked the crunchy texture of the pine nuts. They broke up the creaminess of the liver and the tender little raisins. I drizzled a little thick balsamic on the leftovers, which made it a bit sweeter, but didn't work particularly well with the orange flavors. In retrospect, I expected this to be sweet like a glazed ham. It might be interesting to try this again, but to glaze the roast with a sweet sauce of orange juice and honey. Thank you for providing a long-lost family recipe. My Italian grandmother who was also a pig farmer made this sausage in the fall. Seems to me she used some nutmeg in hers. When she made them, all the meat when through the hand grinder, mixed in the nuts and raisins, made patties and wrapped them in caul fat. I have my doubts that grandma would have used pine nuts but then she was pretty frugal. If caul fat wasn't available, then the patties were dusted with corn meal. Pan fry the patties and serve with eggs for breakfast.